Another Friday night, another movie on Amazon along with some burgers and fries. Too tired to make it out to Beverly Hills for some big screen Kirk Douglas action in The Vikings (I'm sorry Kirk! 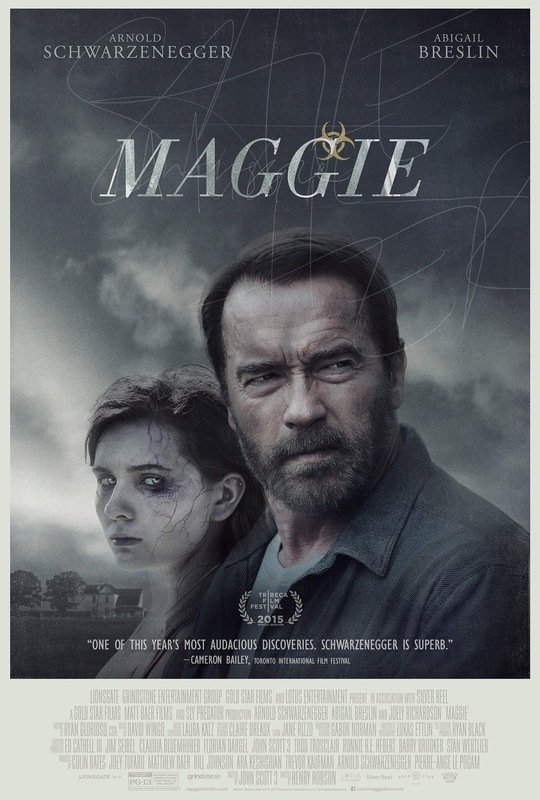 ), we stayed in and checked out the latest from one Arnold Schwarzenegger; the low budget zombie-drama Maggie. The Henry Hobson directed, John Scott 3 film was given a small release the same week as Pound of Flesh and Skin Trade, we didn't make it over to the Sundance Cinemas to see it on the big screen. It was a marked change of pace for The Oak as the film cost under $10 million bucks and wasn't exactly a typical action movie in the Schwazenegger vein. Instead, it's a quiet, somber and mildly paced look at family and the father/daughter dynamic. Set in small town America outside Kansas City, a necroambulist plague has struck the country basically turning people into brain dead, flesh eating zombies. Society hasn't completely collapsed as police and doctors are still around. Medical professionals can't stop the infection but they do know how it works. After being bitten, you still have several weeks before you need to be put in quarantine to basically be poisoned or eaten. Wade Vogel (Arnold) goes to the city to find his runaway daughter Maggie (Abigail Breslin) as she doesn't want to burden the family. Wade brings her home and they try to enjoy their remaining time. But it's only a matter of tick tocks before Maggie's flesh begins to rot and she wants to devour some human flesh. Maggie is a quiet movie. It's a slow one too. There's a few scares and some terrific ambiance of quiet farms and woods and quick glimpses of broken down society. Arnold puts in solid work as the sad dad trying to "rescue" his daughter and Breslin does fine as the teenage daughter dealing with an unbelievable but inevitable end. Somehow you buy Arnold as a farmer and in a probable first, he rocks a cardigan and looks Damme good in it. It's an interesting conundrum, watching your daughter die and trying to protect her from those who would take her away. But in the end, nobody wants to let their friends or family go yet when the infected endanger the rest of society, it's a bit selfish to want to be left alone isn't it? After Arnold ended his term as Governor, there was much excitement about what his first film project would be. There was Cry Macho, about a horse trainer sent to Mexico to retrieve a runaway kid and their bonding journey back home. That sounded like an interesting role for the older Arnold but the project fell by the wayside. Hopefully Maggie leads to more quiet films from The Oak as I'm not overly interested in him rehashing former glory. But after the failures of The Last Stand and Sabotage, those are just the times we're living in. Labels: Arnold Schwarzenegger, This I Demand!